Hi everybody! Today I want to tell you about one of my current favourite restaurants: Rita's Cafeteria in Abbotsford. 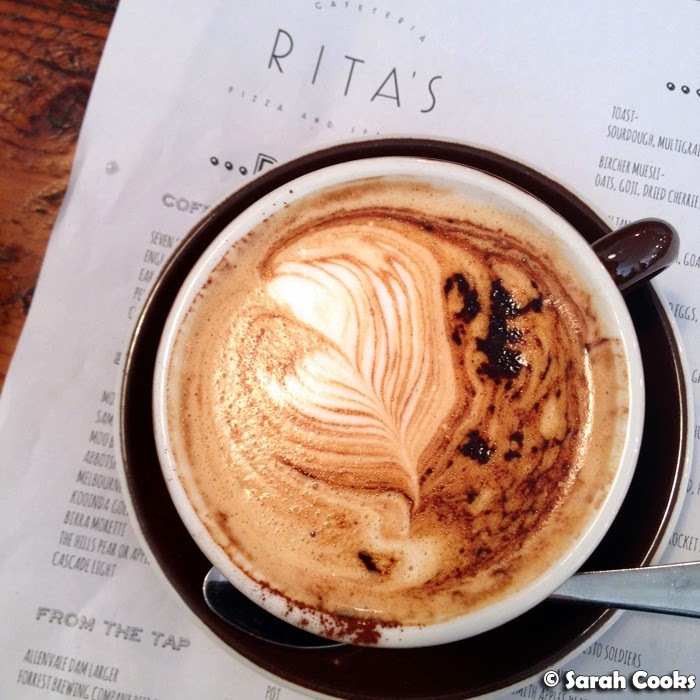 Rita's opened in May 2012, and by my estimation is one of the earliest of the new wave of hipster cafes to open up along rapidly gentrifying Johnston street. 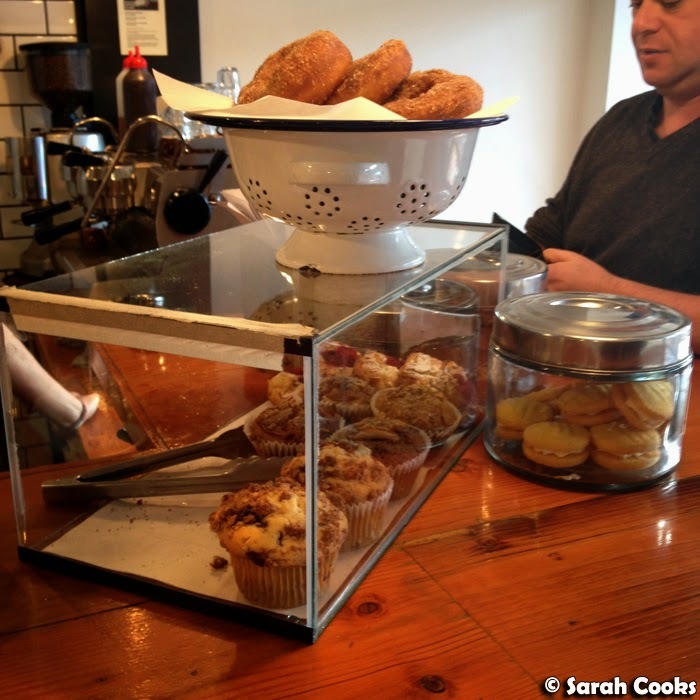 (Other place on my radar are: Dr. Morse, Admiral Cheng-Ho, Bluebird Espresso and Bayte). I first came here early in the year for lunch with my friend D-Slam, who loves their pizzas. We really enjoyed it, and I've since been back twice more: once for Sandra's birthday dinner with some awesome blogger buddies, and most recently for brunch with my folks. 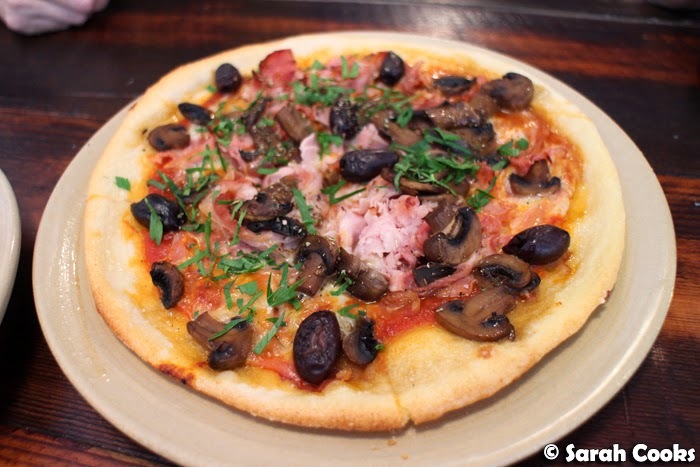 The pizzas are thin crust, and have a crisp, almost biscuity base, and there are over twenty flavours to choose from. Normally such a really wide-ranging menu would trigger alarm bells for me, but all the pizzas we've tried have been excellent. They're also well priced - at approximately $14 for a medium or $18 for a large. (The pizzas below are all medium sized). 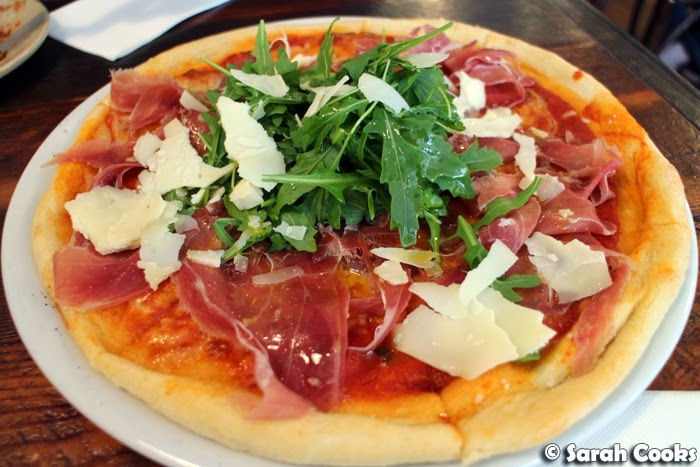 Prosciutto with tomato, mozzarella, onion, pecorino and rocket - a simple combo done really well. Rita's capriciossa is a world away from the ones I used to eat as a kid at my local suburban Italian joint, which were piled high with a thick layer of dubious ham shreds and dry sliced olives. 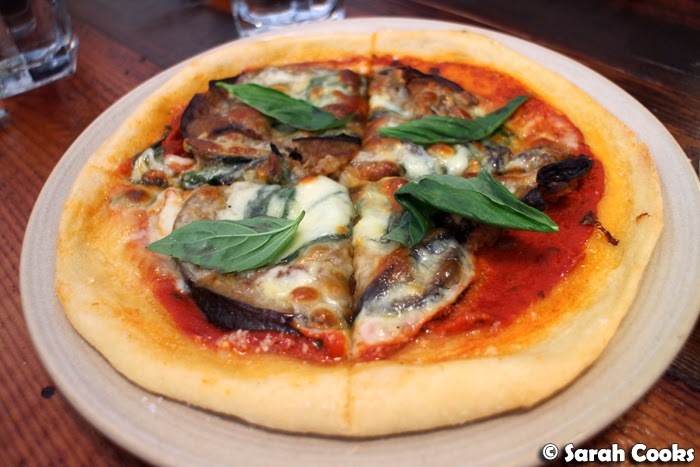 Although I am certainly a fan of ze cured meats, the eggplant parmigiana is also a favourite of mine - love the silky eggplant, rich tomato sauce, and milky, milky fior di latte. These next photos are from the dinner we had there for Sandra's birthday. 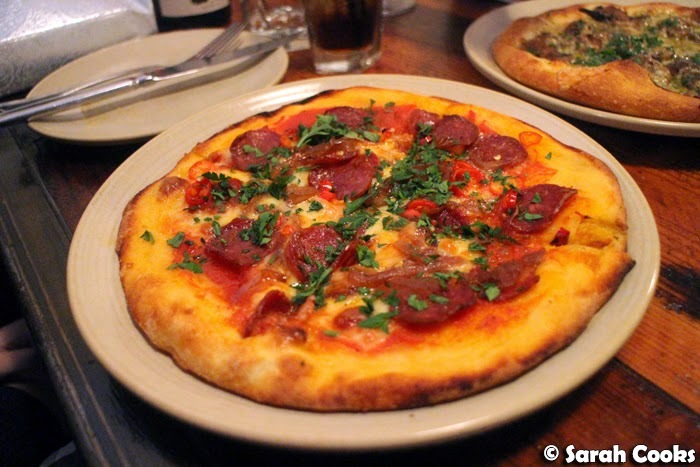 We went in a group of seven (reservations are accepted for groups of six or more), and in addition to the pizzas, we also got to try some different dishes, antipasti and desserts - all of which were impressive. I should mention that the atmosphere on a busy evening is quite different from during the day. Whilst it's quite laid back during the day, the night we were there it was packed and extremely noisy, with the service being a little distracted as a result. (E.g. it was really hard to get the waitstaff's attention, water jugs went unrefilled, the table was cleared halfway and then forgotten about). These weren't dealbreakers, and whilst it didn't impede our enjoyment of the evening, I thought it was worth mentioning, as the atmosphere seems really different between lunch and dinner. Ok, let's look at the food! 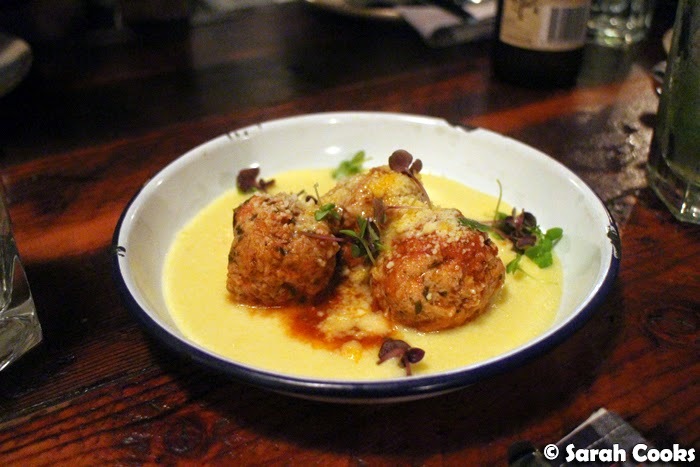 The polenta here was rich, smooth and creamy, and the meatballs were juicy and full of flavour. On a side note, I am a sucker for enamel plates. Aren't they pretty! 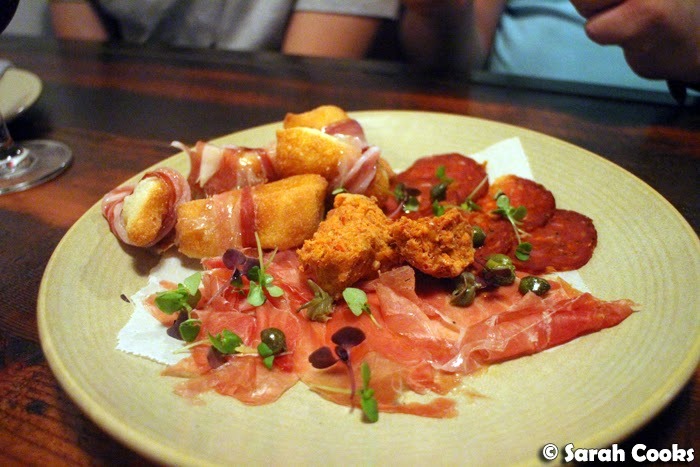 I loved the plate of cured meats, especially the pizza fritta: fried pieces of bread dough wrapped in pancetta. Also noteworthy was the nduja, a spicy spreadable pork sausage. Yum! 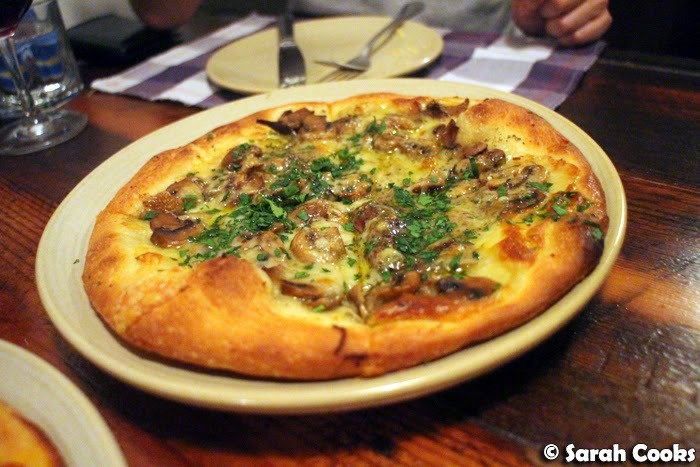 The mushroom pizza is my favourite of all, and we've ordered it on every visit. It's simple but delicious, and the judicious drizzle of truffle oil enhances the mushroomy flavours without being overpowering. I don't really need to describe the pepperoni pizza - you can see in the picture how awesome it was! 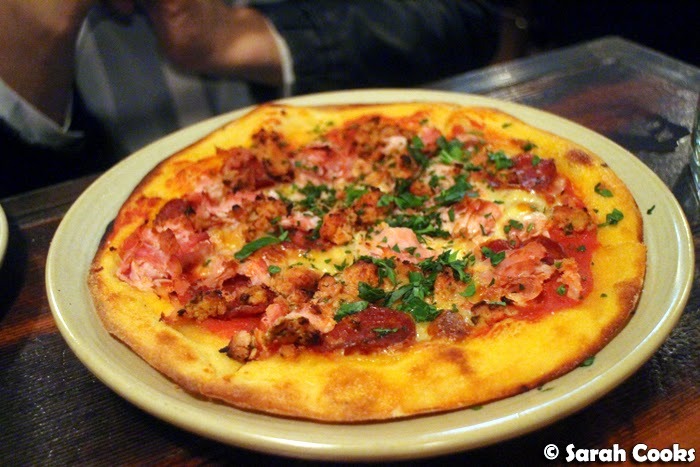 The Meat Eater pizza is intense, but really good if you've got a big appetite and are super into delicious meats. 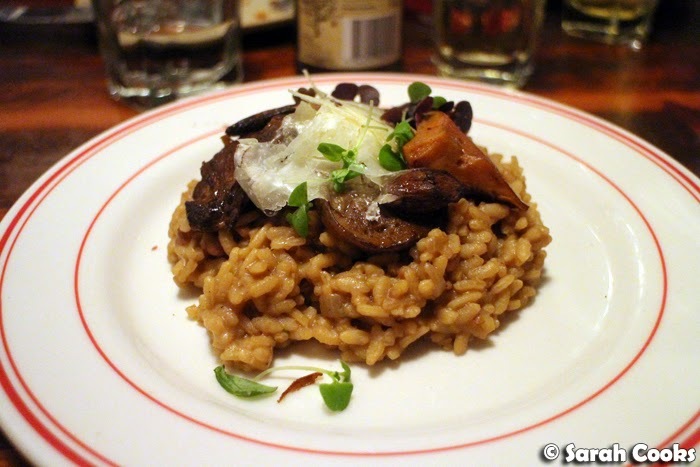 I shared the pine mushroom risotto with Wince - it was cooked well and had generous chunks of grainy chestnuts throughout. 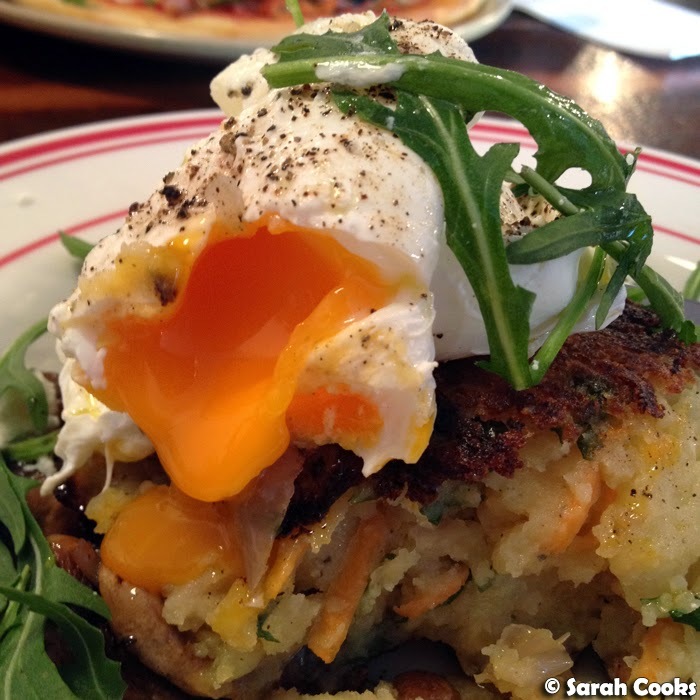 A nice, rich, autumnal dish. 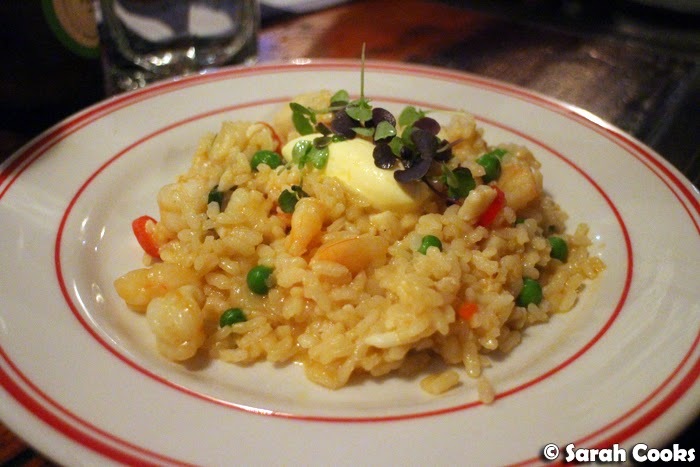 I didn't try the prawn and crab risotto, but it looked pretty, and my friend who ordered it gave it the thumbs up! 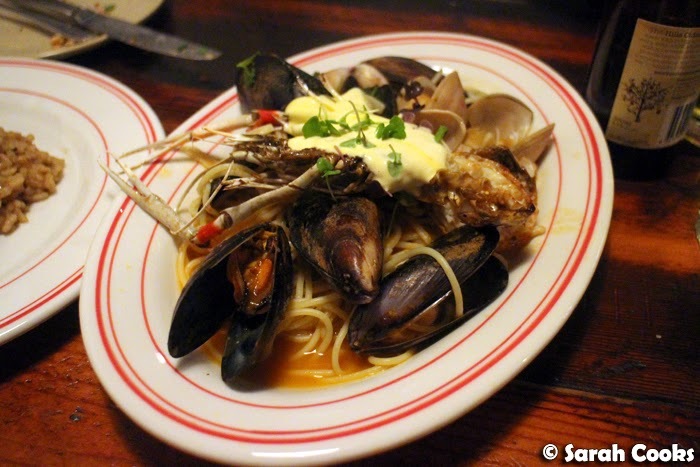 The seafood spaghetti was a generous serving, piled high with fresh mussels, clams and even a scampi, but the cold rouille didn't seem to add much. Ok, so for a pizza joint, I was not expecting to have any exciting side dishes (I mean, pizzas, pastas and risotti are pretty filling) - but seeing as we were here in a big group we got to try these mysterious-sounding roast new potatoes and bone marrow. And OMG - they were totally amazing! The potatoes were roasted in bone marrow, meaning they were fluffy on the inside, and super-duper crispy and delicious on the outside. 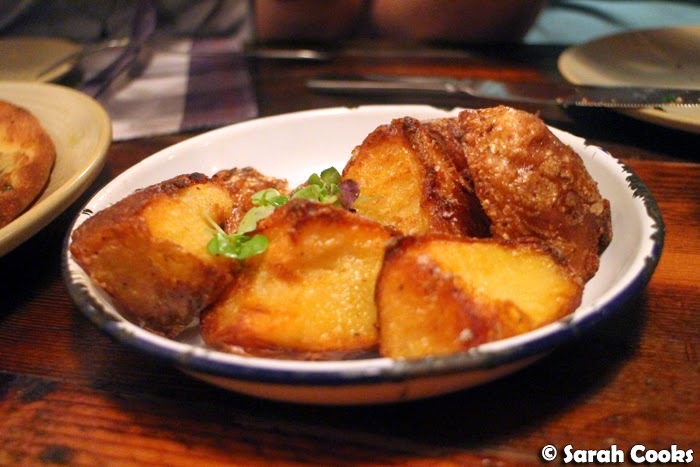 They're the best roast potatoes I've ever had at a restaurant! I loved the orange and ricotta donuts. Some in our group found them a little undercooked, but I'm a fan of doughiness so I enjoyed them. 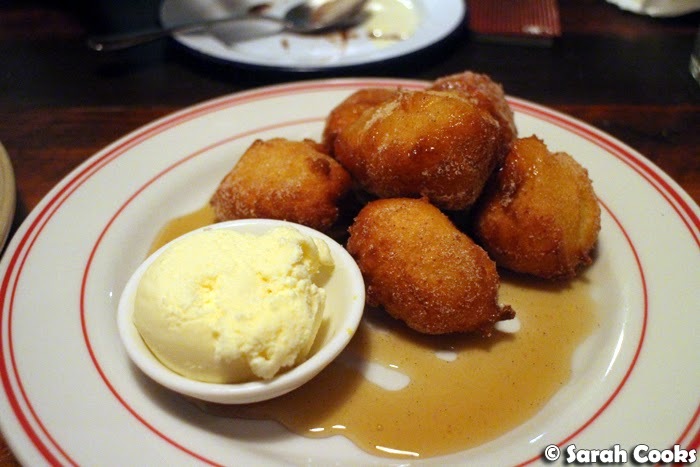 I'm not into all those crazy iced donuts that seem to be so crazy popular right now, and much prefer simple balls of fried dough dusted in sugar. 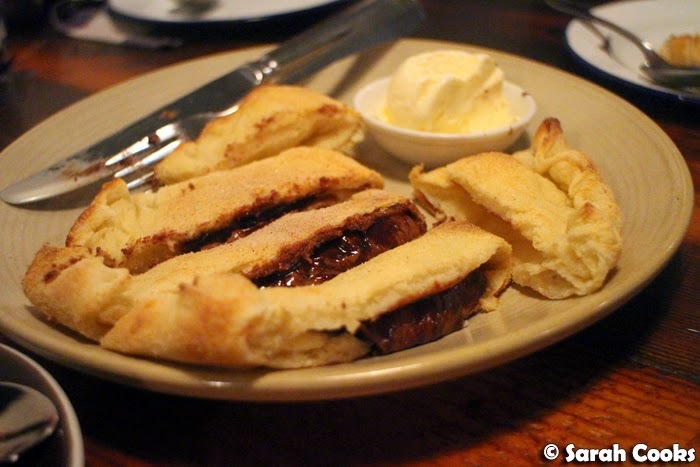 Nutella calzone, what can I say? Crisp and chewy yeasted dough, loads of nutella, and a light dusting of cinnamon sugar. Wow. And we also got a tiramisu. 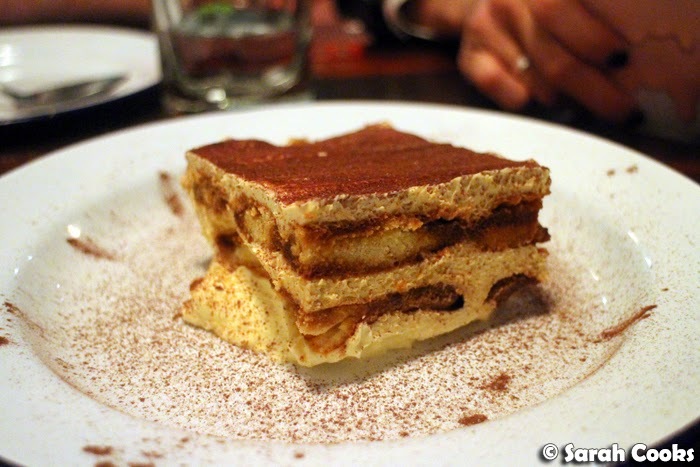 This was the best tiramisu I've had in ages. For some reason, I'd been ordering tiramisu heaps over the April / May birthday period - Cecconi's, Mister Bianco, Tutto Bene, each of which presented the classic dessert in their own individual way - and Rita's simple version was my favourite. It had the perfect balance of coffee and liquor, was lovely and creamy whilst still being light in texture. If you can only get one dessert, I'd suggest you go for this one. 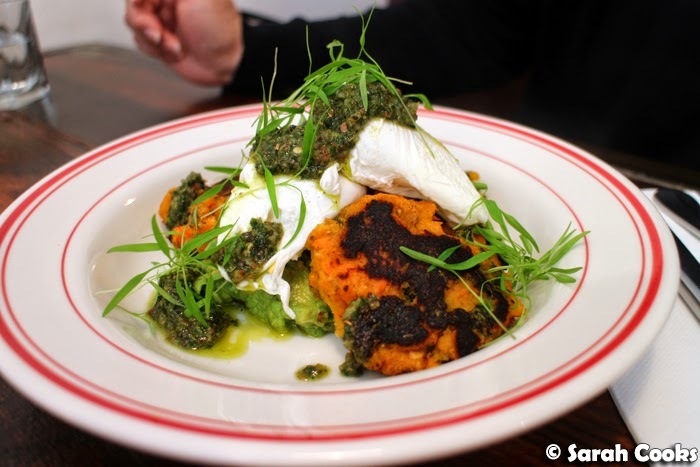 My mum unintentionally went for the hipster-est item on the brekky menu: pumpkin and kale fritters, with poached eggs, smashed avocado and chimicurri. She really liked it, with the salty chimichurri matching nicely with the slightly sweet pumpkin fritters. 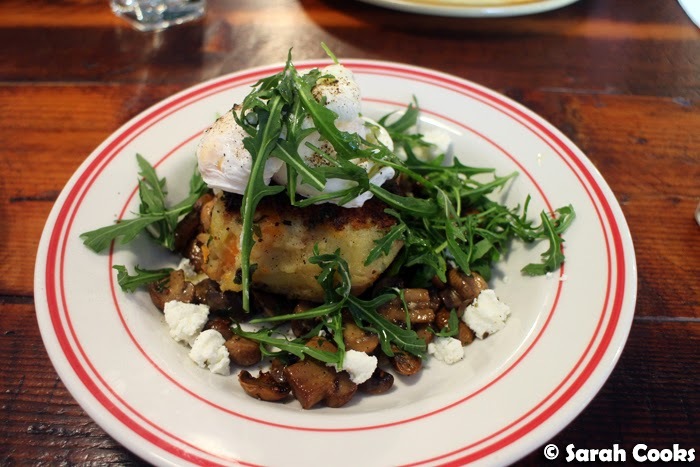 I went for the vego bubble and squeak - a giant fried mashed potato patty with truffled sauteed mushrooms, goats curd and two poached eggs. I am always in favour of potato-based meals, hehe. Unfortunately on this visit we were too full for anything sweet (not even those donuts on the counter! ), so will have to save that for a future visit. Hopefully sooner rather than later! With so many different restaurants and cafes opening up all the time in Melbourne, it's really rare for me to find somewhere that I want to visit more than once, and even rarer for me to like it so much that I actually make the repeat visits. Good job, Rita's, good job. I was all over the eggplant parmigiana pizza until I saw the roast potatoes with bone marrow. ARGH. SO MUCH NEED. 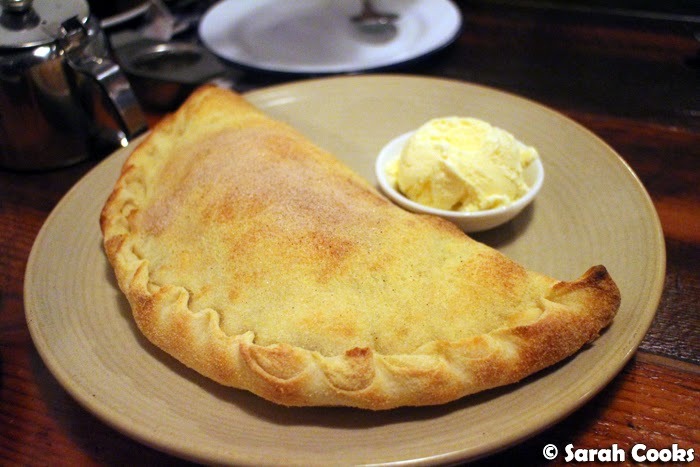 Nutella calzone sounds amazing :) :) i love crispy potatoes!! Have tried to make sim eat home but it triggered our unit's fire alarm!! I kept expecting this post to end, but there were just more and more visits to come! That's when you know somewhere is good, when there's been multiple visits! The super thin crust pizza looks amazing. I hope you realise that I think his parents named him D-Slam.